My sons take medicine like champs. Liquid or pills, it doesn’t matter. I have never seen kids do it with such grace. I wish I was able to be like that. I can take pills with no problems but, trying to choke downa liquid usually results in some type of projectile. Glad I shared that aren’t you? We had a nasty round of the, what the hospital “thought” was, the flu hit out house this week. My family has been lucky enough to escape it all these years. Spencer (7) just passed it around the house. It really wasn’t pretty. I am happy to say that 5 days, and a few gallons of bleach later, we are all almsot back to our old crazy selves again. While I hope you and your family stay healthy through cough, cold and flu season, I am happy to share what really helped me get through being the Mom, with the flu, treating everyone else, with the flu. Sounds like a fun time doesn’t it? I have always taken DayQuil and NyQuil. When the Vicks came out with DayQuil and NyQuil Severe, it was pretty obvious that I would want to try it. Since Walmart is the closest store to my home, I sent the dude down to get me some. Why? Because Walmart has everything you need to get through cold and flu season of course! In one stop, you can grab Vicks Severe, Puffs tissues, ingredients for chicken soup, and a warm blanket. YAY for the electric blanket! Now, regardless of anything you hear about bloggers, I would never endorse a product that I hated, just for a free sample or a few bucks. With that being said, this stuff ROCKS! Yes, you heard me correctly. The original DayQuil and NyQuil would get me through. The Sever version, had amazing results. I felt picture perfect, other than being a bit blah from running around, in just a day. I took the NyQuil, passed out like a sleeping baby after a feeding, and woke up able to breath and no headache. I was pretty incapacitated the day before. Here are some of the great things you can expect from Vicks DayQuil and NyQuil Severe. If you aren’t feeling like yourself today, don’t take my word for it. Take a run to your nearest Walmart and pick some up! Vicks has upgraded with this new product. You can also follow DayQuil/NyQuil on Facebook. If you are not feeling sick just yet, think ahead and be prepared! 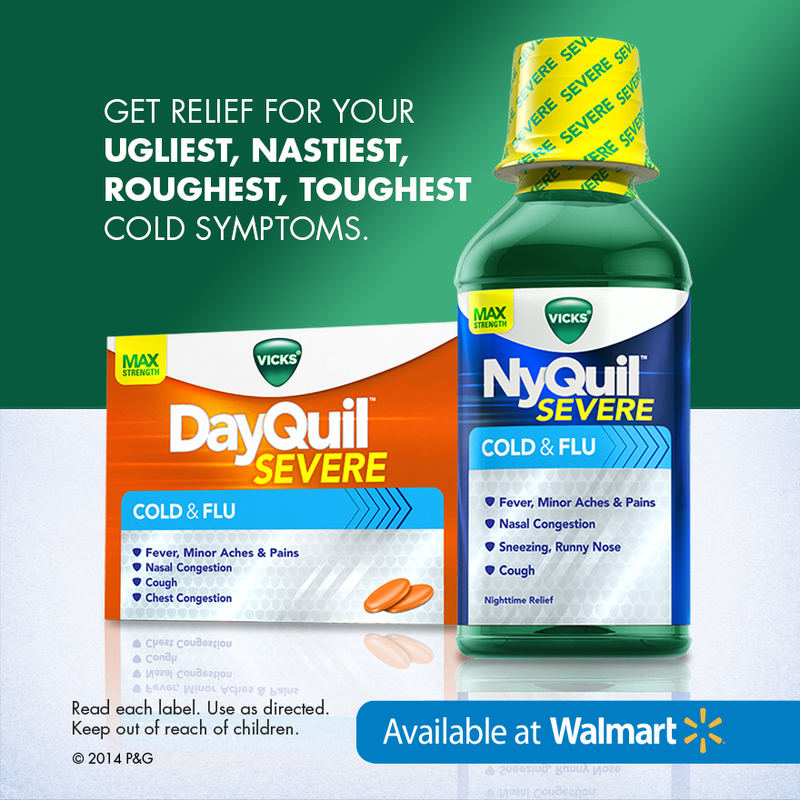 You can order your Vicks DayQuil and Nyquil, from the comfort of your own couch, from Walmart.com. Have you tried it? Tell me how it worked for you! Enter to win a $100 Walmart Gift Card from DelightfulChaos.com! Disclosure: This is a sponsored post for SheSpeaks/P&G”. 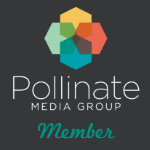 The giveaway is sponsored by Mak Media and is in no way affiliated with the post sponsor. Good Luck! Luckly have not had flu… but have a bottle in med. cabinet just in case. I use good old Vick’s when I just want to take break and get better. I know if I take it, I’ll be out, so I have to be careful that I know I won’t have to go anywhere. Even the Dayquil makes me tired. :/ Love it though to help when not feeling good! I have not yet tried the Severe formula but have been a long time lover of Vick’s. I remember rubbing it on my daughter’s feet to ease her breathing. She didn’t want it on her chest and her soles worked just fine. No, haven’t tried it yet. It will be on my list to try. I’ve never tried the “Severe” version, but I’ve used Vicks DayQuil/NyQuil plenty for colds and it does help. I am a loyal Dayquill user. Love this stuff & recommend it to everyone! I have not tried NyQuil Severe yet! I have not tried the Nyquil Severe yet. I know that regular old Nyquil is a wonderful thing when you feel terrible and need rest! Luckily, I have been germ-free all winter so I haven’t tried this yet, but when the time comes, I will. Yes i have tried Vicks DayQuil/NyQuil Severe and is works wonders! It is my go to product and I always have some on hand. We tried the Nyquil for this winter and it worked great on helping hubby sleep when he got the flu! I have tried them both and love them! I love Dayquil and Nyquil but I don’t think that I have tried the severe yet…. but I am sure that it works great. just the regular ones work great for me! I have tried Vicks DayQuil/NyQuil Severe and it helped me get through the day without a lot of symptoms and made me feel so much better when I felt so miserable! I have not tried the Severe yet but i have tried regular Dayquil and Nyquil. I’m sure i would try it if i was to get a cold right now. I always thought these worked best with me. I haven’t tried it yet, but it sounds great! Believe it or not, Nyquil helps me with my Fibromyalgia! When I have a flair up, most of the symptoms mimic the flu and for 5 years prior to being diagnosed, I actually thought I had the flu! I’ve tried Theraflu but it wasn’t strong enough to get me through the day, not to mention the taste was horrible! At any given moment, you can find Nyquil in my medicine cabinet! I have not tried the Vicks DayQuil/NyQuil Severe yet, however, I stock up on the regular every winter. We have had colds, but no flu yet and all of us trust Vicks to help us get through our days and nights! I have tried the NyQuil and it really helped sooth my cough so I could sleep better. I tried this last month and it worked well on my cold. We keep the Vicks Nyquil (both day and night) on hand during winter; somebody always doesn’t feel well. This stuff helps always gets the feet on the floor and get going. I haven’t tried them yet but if I get the flu, I definitely will. I have not tried it, but we are fans of regular NyQuil, so we will have to try it out. I Have Not Tried Nyquil Severe Yet. No have not used thier products in few years. I have tried Nyquil and I slept like a baby! I have not had the chance to try it yet. I haven’t tried it yet but next time I have an allergy attack I will definitely give it a try. I have not tried the Severe yet. Growing up, whenever we got colds as teenagers, my dad has us take NyQuil! I remember I hated the taste…but it always made me feel better and get a good night sleep! I still take it today when we get colds….cant wait to try the new Severe! I love taking DayQuil/NyQuil on my sick days. It really helps me get better in days. But I haven’t tried the Severe one. Dayquil/ Nyquil is the best thing to take is you are feeling under the weather..I have never tried the severe one but I am sure it works great. Like everyone else I hate to be sick. I have not but I would definitely be open to trying the product. We have tried regular Nyquil and Dayquil, but the Severe. I’ve used Dayquil and Nyquil a lot, but haven’t tried the severe yet. I will though. I have not, but I should I’m not feeling that great today.. I have not tried them yet, but I’ve already had one terrible cold this winter so I need to stock up! I tried Vicks Nyquil Severe when I had a bad cold in January. It really pulled me through! I have tried the DayQuil Capsules and I think they helped. But I am a firm believer of NyQuil at night when I’m sick. It sure helps me sleep better! Ive tried them all and in fact used them all in this past week, since Ive been sick! they all work great for me. No complaints! I haven’t tried it yet. Thankfully I have not been sick this winter..knock on wood. I am a huge fan of Vick’s products though. I have tried Vicks DayQuil/NyQuil Severe and it works for me.